Not quite yet, but I will be soon! Sessions available again from Saturday the 15th of August. Please email me with any inquiries as I will not respond to any text messages or voicemail. 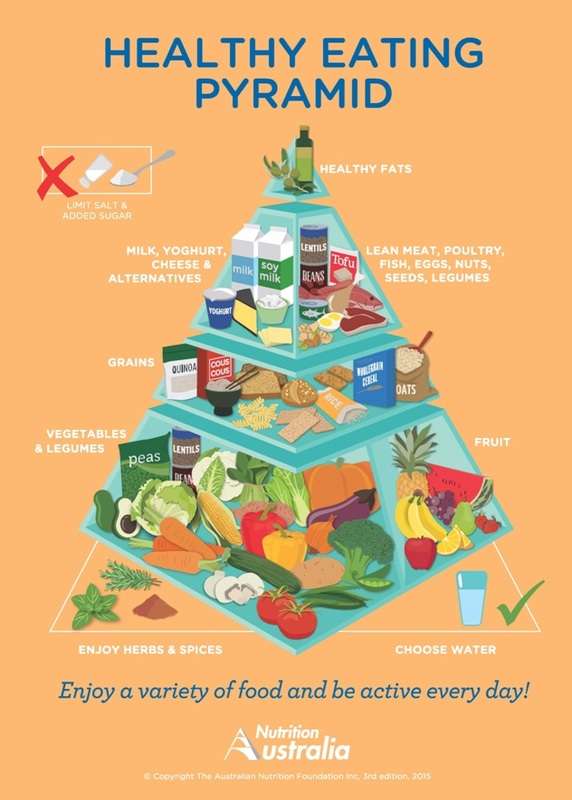 This is a hot topic, as finally this year we had an update even on the general Australian food guidelines. So even the officials have finally got it, that the main staples in our diet should be vegetables and fruit! But let’s stick with the vegetables for the time being, shall we. This is in terms of 80% out of the 100% intake should be ‘healthy’. I like to look at it form an alkaline/acid aspect. Feed your body 80% alkalizing foods and that is the best way to make the healthiest choices. For the the 20% you can go with the more acidic foods and still feel good about it. 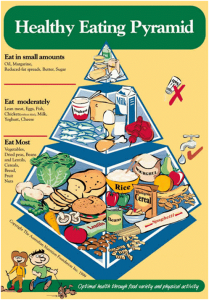 Eating this way is more a lifestyle than a diet because you are not counting calories, or aren’t allowed certain foods – it is simply healthy eating! 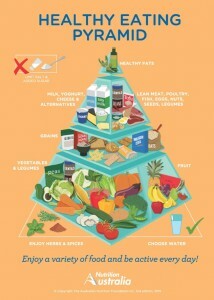 The important thing is: Do not get caught in worrying to eat lots of different vegetables. If you struggle to get in enough, your first point of focus should be to increase the amount. Sure it is better to eat variety, but that will come with time. Order them online – This guarantees fresh produce every week. fresh, compared to long transport and storage times. 2) Have back-ups – Frozen vegetables can be as nutritious as fresh. Steam them and use minimal water, as it leeches the vitamins. 3) Cut them up – They are the perfect snack food. With a nice dip you will not need chips to enjoy your favorite movie. 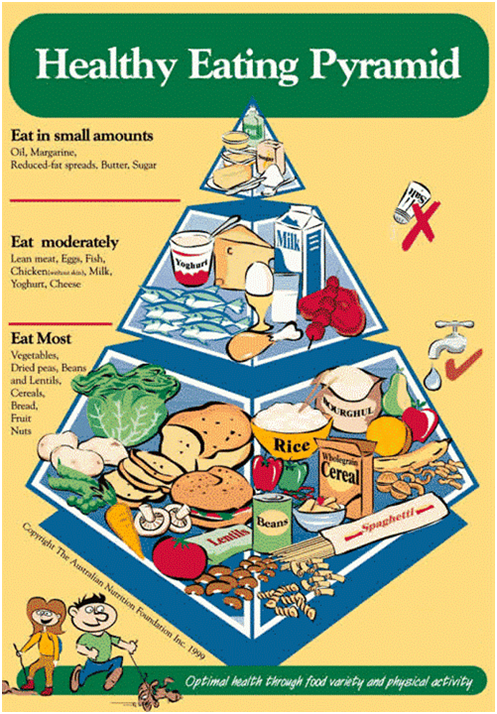 4) Half-plate rule – 1/2 to 3/4 of your plate should be filled with vegetables. 5) Order extra when eating out – Order sides of salad or vegies in restaurants. just give it a quick search on google and you will find an array of recipes. 7) Dress them up – Vegetables don’t have to be boring. Bake in olive oil, serve with a light cheese sauce or butter and herbs or stir-fry with oyster or hoisin sauce. 8) Soup or salad – Recent studies show, that starting a meal with a plain broth-style soup or salad can reduce the risk of overeating on the wrong foods. 9) Juice it – A juice made primarily from vegetables is a nutritious addition to the day. This also goes for smoothies, or since we are still in winter, a hearty soup. Check through my newsletters for recipe ideas. And that is it, let me know how you go with this one. The ALs are to be named as the Superficial Front Arm line (SFAL), the Superficial Back Arm Line )SBAL), the Deep Back Arm Line (DBAL) and the Deep Front Arm Line (DFAL). 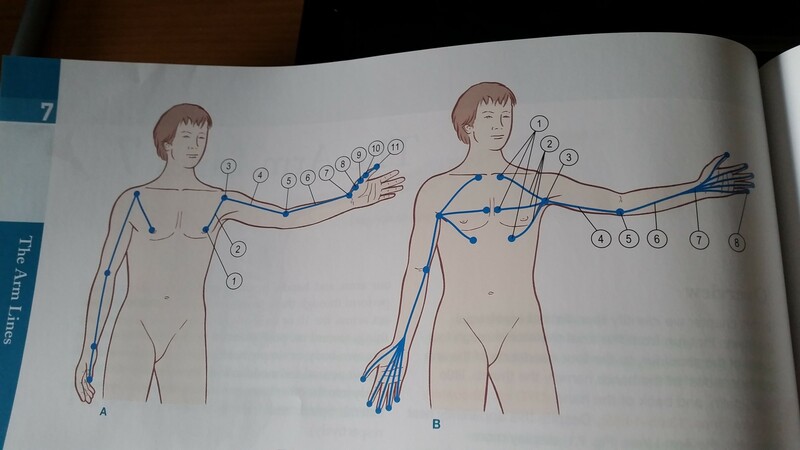 All of these lines run from the axial skeleton through the shoulder along the arms into the hands. They show multiple crossover linkages which is necessary for mobility in multiple directions. What do the Arm Lines do postural? Even though these lines are not part of the human upright structure, they do have an impact on our overall posture. Take driving or desk work as an example. By having the arms in front of us in those positions, strain is put onto the mid back, and often we see poor posture of the shoulders, which can have a big impact on the rib cage, the neck, and our breathing. What do the Arm Lines do in movement? The ALs act in pushing, pulling, and stabilizing. Furthermore the ALs connect seamlessly into the Lateral -, the Spiral -, and the Functional Lines, and therefore play a role in all sorts of movements. Compensation patterns that can be associated with the ALs can be all kind of shoulder problems, back and neck issues, breathing problems, and the more obvious actual arm and hand problems. Shoulder can often be seen protracted, retracted, lifted or rounded. 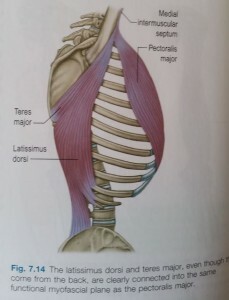 This goes usually hand in hand with a lack of support from the rib cage, which leads to a connection with the cardinal lines (Front and Back) as well as the Spiral and the Deep Front Line. Carpal tunnel, elbow and shoulder impingements are often signs of long ongoing postural and supportive faults in those lines. Having your arm relaxed with the palm facing forward exposes the Superficial Front Arm Line starting from the hands (palmar muscles) along the lower arm flexors to the inter-muscular septum and into pectoralis major. The Superficial Back Arm Line is ,you guessed it, on the back side of your arm, coming through the extensors, to the lateral inter-muscular septum, into the deltoid and trapezius. Lifting your arm yo to the side now with your thumb facing forward it exposes the Deep Front Arm Line from the thenar muscles, through the radius, into the biceps and (under pec major) into pectoralis minor. 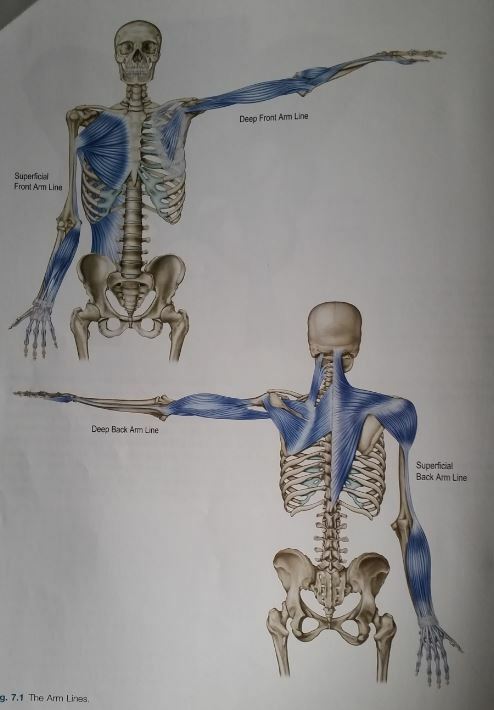 The Deep Back Arm Line comes from the hypothenar muscles, through the ulnar, into the triceps and rotator cuff, further into the rhomboids and levator scapluae, by going under the trapezius. The DFAL begins on the anterior aspect of the 1)3rd, 4th and 5th ribs with 2)pectoralis minor which is embedded in the clavipectoral fascia. Through the distal station of pec minor, the 3)coracoid process of the scapula, the lines tracks along 4)biceps brachii and coracobrachialis into 5)the radial tuberosity. From here it moves on along the 6)radial periosteum towards the 7)styloid process of the radius into the 8)raidal collateral ligaments and thenar muscle, via the 9)scaphoid and trapezium to the 10)outside of the thumb. In normal hanging arm posture a shortness of the distal DFAL will pull on the coracoid process and lead to an anterior tilt of the scapula which is seen as round shoulders. The DFAL is primarily a stabilizing line, from the thumb to the chest. It controls the angle of the hand as well as the thumb’s grip. 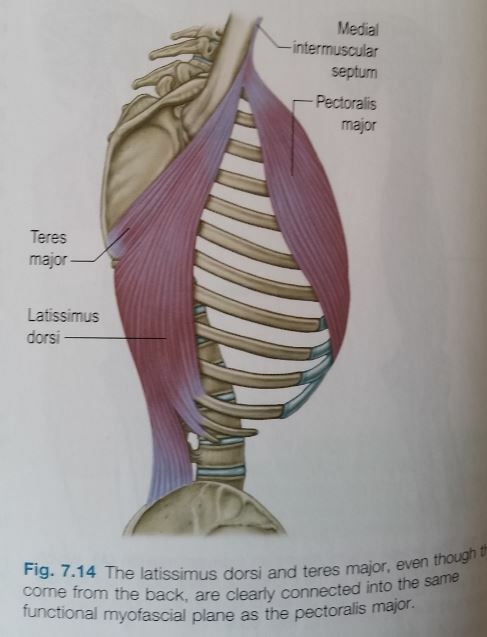 This makes more sense coming into 2)where pec major and latissimus dorsi meet, as well as teres majoy, as all these twist into bands ataching along side each other to the underside of the anterior humerus (see picture). 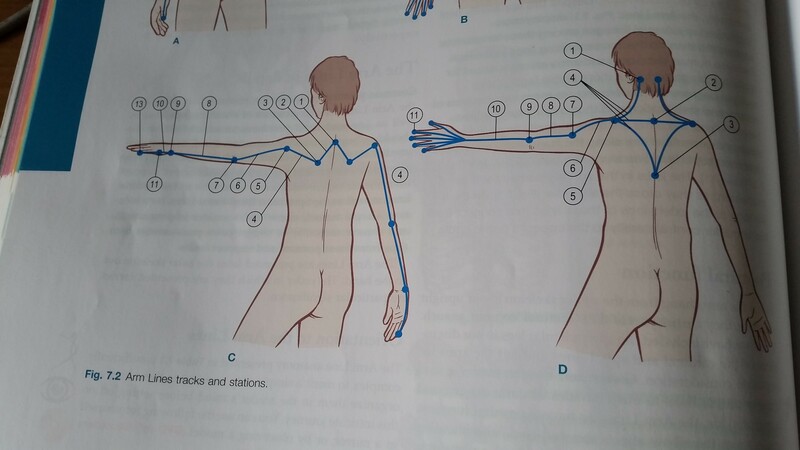 From there the SFAL tracks medial along the 3)humeral line, the 4)intermuscular septum of the upper arm and the 5)humeral epicondyle, moving into the 6)flexor group through the 7)carpal tunnel into the 8)palmar surface of the fingers. The SFAL controls positioning of the arm infront and beside us, as well as participates with the DFAL in grip controlling the wrist and fingers. The DBAL starts at the 1)spinous processes of the upper thoracic and the 7th cervical vertebrae, tracking down and out via the 2)rhomboids to the 3)medial border of the shoulder-blade. 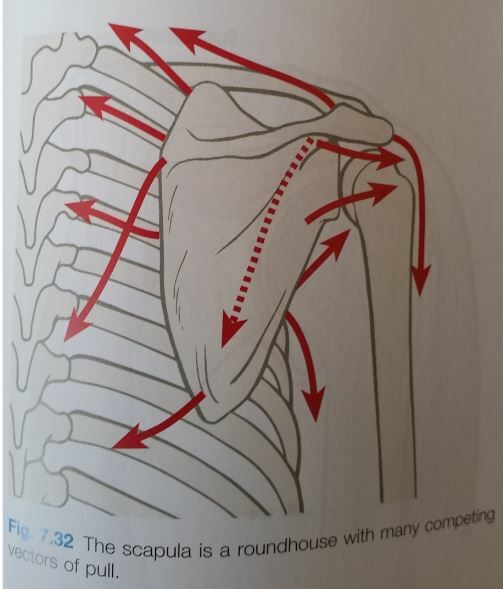 Remember from last month, the rhomboids are also part of the Spiral Line, though the SL goes then deep underneath the scapula, where as the DBAL continues superficial to the scapula via the rotator cuff, in particular the infrapsinatus and teres minor. The next station is then on the posterior side of the humerus, the greater tubercle. It is important to mention here, that there is another branch of the DFAL which begins on the 1)lateral (side) lower surface of the occiput (rectus capitis lateralis), tracking down through 2)levator scapulae via the first four cervical vertebrae. This line then links through the superior (top) angle of the scapula to the supraspinatus, which runs along on top of the scapula towards the greater tubercle of the humerus. The forth muscle of the 4)rotator cuff complex, the subscapularis, covers the anterior surface (the front, which faces the ribs) of the scapula. The fibers of the muscle connect to the anterior aspect of the 5)head of the humerus. The rotator cuff muscles control the head of the humerus. This way the whole of the rotatorcuff is linked into the DBAL. Close to where the rotator cuff attaches to the humerus, originates the longest head of the 6)triceps brachii. The triceps tacks down to the 7)tip of the elbow. From here the lines becomes purely fascia moving along the 8)periosteum of the ulna. Once we reach the 9)ulnar styloid process on the outside of the wrist,we keep following the ligamentous capsule of the wrist: 10)Ulnar collateral ligament, 11)triquetral and hamate carpal bones. This leads us to the periostea and ligaments that run up the 13)pinky finger. The 12)hypothenar muscles are also part of the line. The DBAL works with the DFAL to adjust the angle of the elbow, to limit or allow side to side movement of the upper body when in a crawl position, and to provide stability along the outside of the hand to the back of the shoulder. The SBAL comes through the wide sweep of the trapeziu’s axial attachments, from the 1)occipital ridge through the 3)spinal process of T12. An interesting point here: 4)The occipital fibres of the trapezius link with the anterior deltoid, the cervical fibers of the traps link with the medial aspect of the deltoid, and the thoracic trap links roughly with the posterior deltoid. So part of the SBAL kind of actually goes to the 5)front of the shoulder to then move to the posterior aspect of the arm. 6)Here it is where all fibers coming from below, medial and above frontal ,converge onto the 7)deltoid tubercle, passing underneath the brachialis muscle to blend with the fibers of the 8)lateral intermuscular septum, which divides the flexors and the extensors (back and front of arm). From here it moves along to the 9)lateral humeral epicondyle, further to the 10)common extensor tendon, passing under the dorsal retinacula to the carpals and 11)fingers. The SBAL controls the arm in movements like the backhand at tennis. It’s main work is to limit and contain the work of the SFAL. One last important point: As it also controls lifting of the shoulder and arm, it tends to get overworked when the rib cage or spine collapses of slumps out from under the shoulder girdle. So there you have it. These are the ALs. In my opinion often overlooked and not integrated enough into treatment or training for that matter. As we have some crossing over between back and front, I didn’t go into it too much as it is quite confusing and just goes too deep for what I am trying to achieve here, it is one of the points I believe why these lines do not get as much attention. They are difficult to reach, a lot of it is periostium which can be rather painful to touch, and in general people do not feel any issues through their arms. So the only areas worked are shoulders, back and neck. But there is always more to the whole picture, and I am myself are still in the process of fully understanding these 4 lines. Melt the butter, add the celery, carrots, onion, garlic, thyme, salt and pepper and cook till vegetables just start to soften. Sprinkle the flour over the vegetable, keep cooking and stir until evenly coated and lightly browned. Add the Wild Rice, stock and water, and bring to the boil, then simmer until vegetables are all tender. If you like your vegies more crisp, precook the rice. Add the chicken, and let it all simmer together for about 10-15 minutes.